It is a good idea to keep track of a pet’s weight. How often they should be weighed depends on age and overall health. 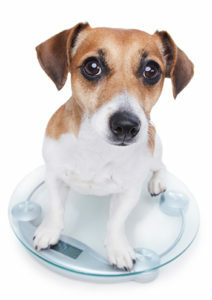 Small kittens and puppies benefit from being weighed often – any weight loss may indicate a problem. Older puppies should be weighed every three to four weeks up until six months of age. An adult, healthy pet can be weighed around every six months. Excessive changes can indicate the pet needs more exercise, more or less food, or even a health issue. Kittens can often be weighed on a kitchen scale. There are special scales available as well. Cats who agree to be held and dogs small enough to be picked up are also easy. Simply weigh yourself, then hold your pet and weigh both of you, and subtract your own weight. If you have a larger dog, most veterinary clinics will let you come in and weigh your pet for free. There are also special scales to purchase. Regardless of method, make sure you use the same scale every time – they can vary a lot. If you find a significant change in weight, consult with your veterinarian.